Mystery Team is an interesting feature in that it forces the audience to accustom itself to the type of humor the film employs. It’s quite peculiar to be jolted into the world that Mystery Team inhabits, particularly because from the opening sequence, one does not completely understand the dynamics of its characters. But what a slew of writers do in constructing the film is essentially create a picture of varying view points, wherein the audience eventually begins to embrace the rather absurd premise. 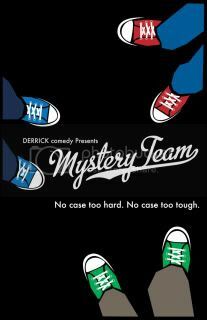 Mystery Team focuses on the exploits of three high school teenagers. The trio is socially alienated for their dated and childish perspective on the world – they behave in the same manner that they did as when they were children, solving mysteries at a dime rate. After a few silly mysteries in the book, they’re eventually approached with the prospect of solving a legitimate mystery – a murder. The film’s comic sensibility is sharp enough to avoid the pitfalls of typical sketch-based comedies – for its premise, Mystery Team is remarkably tight. We move from scene to scene with a rich sense of comic intellect matched with a keen grasp of social insight. Another key element to the film’s success stems from its stellar casting – composed of the sort of individuals that populate NBC’s Thursday block of comedy, Mystery Team is enabled by an incredibly youthful and fresh amount of faces. Donald Glover has an infectious charm as the film’s central socially-stunted character, while his supporting crew of Scooby-Doo detectives fit the bill perfectly. Aubrey Plaza as the central love interest isn’t that much of a departure from her Parks and Recreation role, but that isn’t entirely a bad thing. As a whole, the likability of all the actors goes a long way in selling me on the premise of the film. What causes the film to falter is its inconsistent sense of pacing and rather languid direction. Dan Eckman is unremarkable in the director’s chair, often framing shots in an all too consistent and all too dull manner. It results in some prolonged monologues that serve to hinder the film’s growing momentum. And such amateurish direction simply serves to undercut the film’s sharper elements. It’s not enough to disparage the film entirely, but one has to wonder what the result would have been had it been left in more capable hands. Mystery Team ends on the possibility of a sequel – here’s hoping there is one.